Overwhelming majority of Israeli Jews feel US president is pro-Israel, just 1% say he is pro-Palestinian Authority. Support for President Donald Trump among Jewish Israelis soared following his recognition of Jerusalem as the Israeli capital last Wednesday. According to a poll conducted by the Smith Research company on behalf of The Jerusalem Post, more than three-quarters (76%) of Israelis believe the Trump administration is solidly pro-Israel. A mere 2% believe the Trump White House favors the Palestinian Authority, with 14% believing the administration is neutral, and 8% who have no opinion. 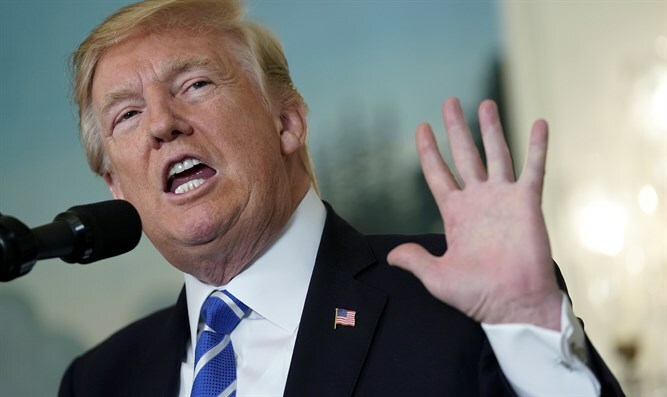 The poll, which was conducted on Wednesday and released Thursday evening, shows that among Israeli Jews, a full 77% believe Trump to be pro-Israel, with just 1% of Israeli Jews responding that the president is more pro-Palestinian. Fifteen percent say the president is neutral, while 7% had no opinion. Israeli Arabs were slightly less inclined to see the Trump administration as pro-Israel, though a large majority (69%) view it as such. By contrast, few Israelis viewed President Trump’s predecessor as being staunchly pro-Israel. Just four percent of respondents told the Smith Research company eight years ago that they believed President Obama was more pro-Israel than pro-Palestinian. Israelis are more divided, however, on whether Trump’s announcement last week would promote a final status agreement between Israel and the Palestinian Authority, with one-third of Jews saying the move will make a final status deal more difficult, 23% saying it will make it more achievable, and 36% saying it will have no effect at all.